Seeking for a software to transfer iPhone to Mac? You got the right place. This article shares top 5 iPhone transfer software to transfer music, photo, video, app, document etc. from iPhone to Mac/PC easily. iPhone data backup has been a daily need for iPhone users to keep their iPhone data safe. iTunes and iCloud can fulfil the task of syncing iPhone iPad iPod data to Mac. However, the notoriously difficult-to-use iTunes would erase the original data after sync or some other iTunes errors. Meanwhile it's easy to use up iCloud's 5GB free storage space for data backup. For that, the more flexible and easy-to-use third-party iPhone transfer softwares are vying for our attention. There are numbers of third party iPhone file transfer available in the market. But what's the best one to transfer and backup iPhone to Mac? Here, we will list top 5 popular software for iPhone backup and transferring, and you can find the one which means the most to you. MacX MediaTrans is absolutely a reliable and ease-to-use iPhone file transfer, making iPhone data transferring and backup never been easier. It allows you to transfer photos, videos, songs, books, ringtone, etc. from iPhone to Mac and vice versa in a click within a few seconds. No space limits. MacX MediaTrans is an all-round iPhone transfer software developed by Digiarty Software. It ranks in the first place owing to its intuitive interface, good stability, fast data transfer speed and strong function of transferring and managing iOS iPhone files and so on. It's noteworthy that the iPhone file transfer can not only transfer iPhone data to Mac what iTunes does, but also what iTunes doesn't. For example, it never makes your iPhone existing data lost, including pictures/music/videos downloaded from online, imported from CD/DVD or purchased somewhere other than iTunes. Here have a check on its main advantages and disadvantages. • Various File Types Support - Almost all file types on your iOS are available, such as photos, videos, music, ebook, ringtone, voice memo, and even some data that are not supported to be backed up via iTunes/iCloud, such as non-purchased music, ringtones, movies. • Excellent Stability - Transfer data from iPhone to Mac or vice versa in great stability. Accidents like crashing, get stuck would never happen. • Blazing Fast Transferring Speed - It takes 8 seconds only to transfer 100 4K photos with the intact quality reserved. • Intuitive & Users-friendly interface - It makes iPhone files transfer never been easier, without the complicated iTunes/iCloud backup and restore process. • Wide Range System Support – macOS Mojave, High Sierra, macOS Sierra, OS X 10.11, 10.10, 10.9, 10.8, 10.7; Windows 10, 8, 7, Vista, XP (64bit & 32bit); iOS 12, iOS 11, iOS 10, 9, 8, 7 are fully supported. Free to scan your iOS data, and transfer limited numbers of files. To transfer more iPhone files to Mac/PC and vice versa, you need to pay. Before you start iPhone to Mac backup, free download the best iPhone transfer program and launch it on your Mac ( Windows version is available as well). 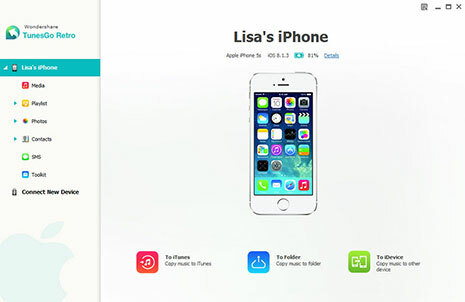 If you want to get your iPhone data backed up fully, visit their official website to purchase it since the free trial version only allows limited times transfer. Step 1: Connect your iPhone XS (Max)/XR/X/8 with Mac via a USB cable. And go iTunes settings to turn off the auto sync in case of any data loss. Step 2: Choose your desired mode: Photo Transfer, Music Manager, Video or Flash Drive. Click the target icon to enter the corresponding window. Step 3: Select the photos/music/videos you wanna transfer from iPhone to Mac. And click "Export" button to backup iPhone to Mac without iTunes. 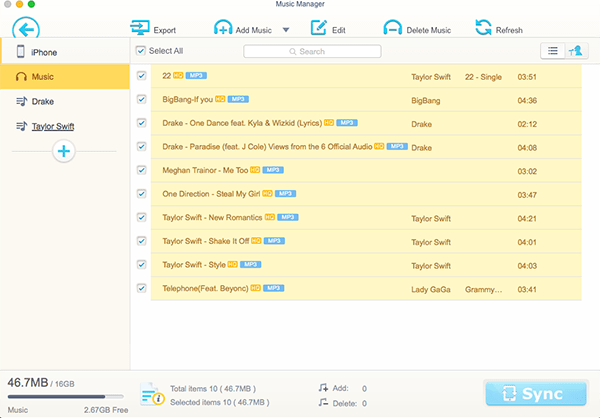 Syncios iPhone Manager can a better alternative to iTunes. 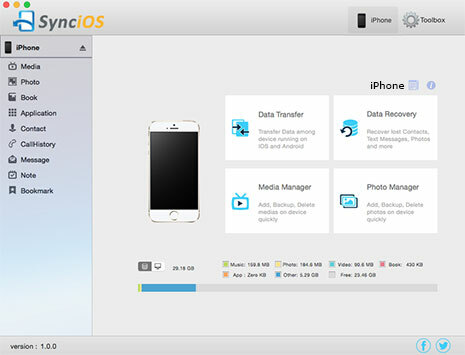 With Syncios you can backup iPhone to Mac seamlessly, namely music, video, photos, apps, podcast, iTunes U, e-Books, contacts, etc. You can also sync your iPhone to iTunes. 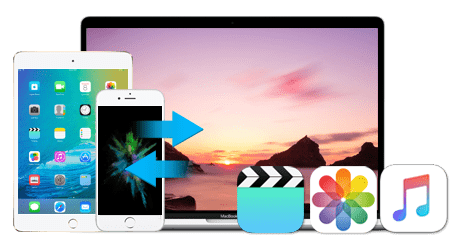 This powerful and user friendly iPhone to Mac transfer also comes with a converting function so as to convert music/videos to iPhone compatible formats. Transfer between PC & iOS: music, videos, photos, apps, contacts, messages etc. The Mac version is inavailable now. No preview and you can't transfer selectively. There are certainly reasons that Wondershare TunesGo ranks at the third place of 5 best data transfer. It's powerful enough to backup iPhone to Mac, including music, videos, photos, voice memos, etc. and rebuild your iTunes Library without any hassle. It's fully compatible with iTunes 12.1, iOS 9, and support iPhone 6 & iPhone 6 Plus etc. Some playlist formats cannot be edited or imported into iOS devices. It's not very affordable at the price of US$49.95 per year. As one of the best iPhone transferring software, Xilisoft iPhone transfer makes iPhone data transfer much easier than ever before. It is capable of backing up iPhone music, SMS, videos, movies, photos, podcasts, etc to Mac and copy files from iPhone to iTunes. Better yet, it also supports file transfer from Mac to iPhone, so that you can recover your iOS iPhone data once it lost by accident. It cannot support to view or transfer HEIC photos on iOS 11/12. It can’t restore crashed iTunes library. 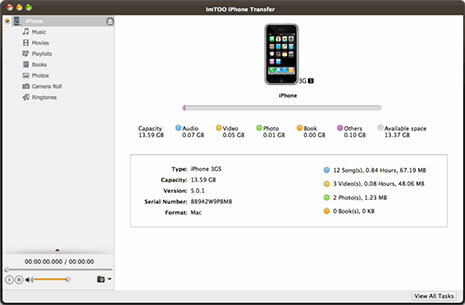 ImTOO iPhone Transfer for Mac is smart iPhone file transfer software to backup SMS, music, videos and photos (including pictures/videos) from iPhone to Mac and vice versa, iPhone to iTunes easily and smoothly. Meanwhile, it supports multiple iDevice connection simultaneously. You can choose two modes of iPhone files transfer: via USB and Wi-Fi. Apply to all iPad/iPhone/iPod models, latest iPhone 6S/6S Plus, iOS 9 and iTunes 12. Manage iPhone photos into photo albums so as to create, delete and edit at will. Easier and faster than iTunes to transfer files between iPhone and Mac. Your iPhone can be used as portable hard disk now with ImTOO iPhone Transfer for Mac to open it in Finder. All the iPhone transfer software we have mentioned above are both available available for both Windows (Win 10 incl.) and Mac OS X (macOS Sierra, El Capitan, Yosemite etc. ) and also supports all the generations of iPhone, iPad and iPod Touch. So for Windows users, you are also allowed to transfer iPhone photos, music, videos, notes, podcast, e-Books, contacts etc. To PCs. The Swiss Knife for iPhone iPad iPod Management. Fast transfer data from iPhone XS (Max)/XR/X/8 to Mac, including photos, videos and music and vice versa, without iTunes.